Beautifully renovated detached holiday house in Drucat. The garden is enclosed, so children go about their business safely. There is a swimming pool, restaurant, tennis court and supermarket in Abbeville (6km). A restaurant and bakery can also be found in Caours (2.5 km). This holiday home proves that \"staying at home\" need not be a punishment. Yet it is a shame to not go out. The Picardy region has so much to offer. 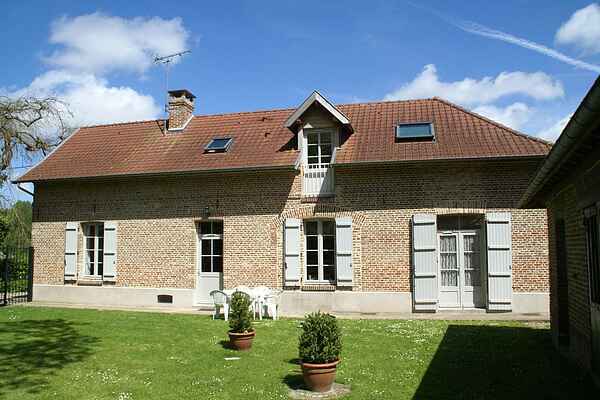 Enjoying woodland surroundings is possible within walking distance in the Forêt de Crécy (6km). The historic towns of Abbeville and St. Riquier (6km) are also nearby. There is an 18-hole golf course in Grand-Laviers (9 km). Do you prefer the salty sea air? Then a good idea is St. Valéry-sur-Somme (25km). The Baie de Somme nature reserve (20km) is also a wonderful alternative. This bay is one of the finest in the world and is considered Picardy's business card by the inhabitants of this region. The Bagatelle theme park is also a lot of fun. It is situated between Berck-sur-Mer (51km) and Le Touquet (60km). Amiens (50km) is known for its museums, its lovely shops, its old town centre and of course, the Notre Dame. You can find it on the UNESCO World Heritage List.